The other day I had an idea. And by other day, I mean twenty years ago. When I was in high school, I discovered the joy that is theatre. And one day, it occurred to me that someone could take the music of “Weird Al” Yankovic and turn it into a stage musical. Sure, you’d have to stitch together the songs in a new way, but it could turn into something fun. But at the time, I dismissed the idea, because no one would ever want to go to a musical based on the collected works of a particular recording artist. Right? Right? I’m right, aren’t I? Eventually this nascent idea vanished into whatever fog occupied my mind when I was a teenager. But funny thing about me: my mind is a big sponge. Stuff gets soaked up into it and then resurfaces at the oddest time. The idea wouldn’t leave me alone. And so, the other night, I printed out a list of every song that “Weird Al” has made (I have them all on my iPod, so it didn’t take long). I immediately eliminated his parodies and his polkas. As great as they are, I suspect that licensing the original music for a musical would be cost prohibitive. Then I started looking at the songs and playing some of them to see if any connections or ideas jumped out. And wouldn’t you know it . . .
ACT I: Our protagonist is a young man named Skipper Dan, a high school thespian with large dreams that crashed and burned badly. As our musical opens, Skipper Dan laments about his career path (“Skipper Dan” from Internet Leaks). He yearns to recapture his lost glory and escape the jungle cruise ride he now helms.His friends, naturally, don’t think that it’s that big of a deal. There’s Wally, his oldest and best friend who’s a little off. There’s Julia, his platonic female friend who works in the local nursing home. And then there’s Gary, a slimy ladies man who has a somewhat genuine heart of gold. As they gather at Wally’s house to enjoy Wally’s superb waffles, Skipper Dan laments how his life is going. Gary tries to sympathize, saying that he doesn’t think he’ll ever achieve his dream of finding the perfect woman. The others scoff at this, pointing out that Gary has never had any success with women. Gary responds by detailing the faults of his previous romantic conquests (“Close But No Cigar” on Straight Outta Lynwood). Skipper Dan says that at least Gary’s making some headway. He wishes that he could break free from the Jungle Cruise Ride. Gary and Dan ask Wally if he has any dreams. Wally responds by saying that his life is perfect the way it is. He’s happy and the others should be too. The three boys press Julia if she has any unfulfilled dreams. She demurs, but it’s pretty obvious that any dreams she has involves Dan. Dan goes to work, settling into his usual routine of helming a boat through the Jungle Cruise Ride. But today, something is different. For starters, Dan’s boss, Mr. Howler, explains that he’s going on vacation and is leaving the park in Dan’s hands. That would be momentous enough, but there is a stunning girl named Melanie at the park, a woman so beautiful that she has suitors lined up to express their affection for her (“Melanie” on Even Worse). Melanie has eyes only for Dan. She explains that she works for a Mr. Krog, a Hollywood producer, who wants to meet with the manager of the park. Of course, that would be Dan himself. They go to a restaurant to meet Mr. Krog, who makes a big entrance, promising the world to the people gathered in the restaurant (“The Check’s in the Mail” on Weird Al Yankovic). Mr. Krog then explains that he is putting together a new horror movie, one he wants to shoot in the Jungle Cruise Ride. It would mean closing the park for the shooting schedule. Dan isn’t sure, so Krog sweetens the deal by offering him the lead role. Dan is naturally interested; it would mean a return to the spotlight for him. He finally dares ask about the title and Krog tells him: Nature Trail to Hell . . . in 3D! (“Nature Trail to Hell” on In 3-D) Krog paints such a brilliant portrait of this movie, Dan immediately accepts. Excited about his news, Dan rushes to tell Wally. Wally is unimpressed. He thinks that Dan is fine as he is. Dan moves on to find Julia at work at the nursing home. The residents aren’t helpful; instead of telling Dan where Julia is, they badger him about how things used to be(“When I Was Your Age” on Off the Deep End). Dan breaks away from the chorus to find Julia sitting with her favorite resident, Mr. Frump, an elderly man hooked up to a breathing apparatus. Julia is excited for Dan until she hears about Melanie. That upsets her but Dan, so excited about his big break, doesn’t notice how hurt she is. As the shooting at the Jungle Cruise Ride begins, Dan is in seventh heaven. He’s sure that this is going to be his big break. He’s especially flattered since Melanie seems to be lavishing a great deal of attention on him. But all is not right. Krog seems to want to tear up a lot of the Ride for the shooting. When Dan protests, Krog gives him an invitation to an exclusive Hollywood party. Melanie agrees to accompany Dan and his friends. The party is great! For starters, Dan runs into a friend of his from college, a kid he knew as Jimmy the Geek who is now a huge Hollywood star (“That Boy Could Dance” on In 3-D). The only one not having a good time is Julia. She’s upset by the way the way Melanie is treating Dan. Dan seems to think that she’s in love with him, but it’s pretty clear she’s not. Wally, in the meantime, overhears Melanie talking to Krog on her cellphone. It becomes pretty clear that Melanie and Krog are up to no good, that Melanie’s job is to pretend to like Dan to keep him distracted. Wally tries to warn Dan, but Dan is too starstruck to listen. So Wally does the only thing he can: he tricks the party’s DJ into playing polka to break it all up (NOTE: I’d love it if this polka could be one of the parodies, but there’s that whole copyright thing). Once the party is over, Dan confronts Wally. Wally points out that he’s hurting Julia. Dan retorts that Wally is just jealous because Dan is finally achieving his dream, something Wally will never do because Wally is stupid. Dan is going to stick with Melanie and fulfill his destiny. Wally responds by saying that he lives his life the way he wants to, without compromise. In short, he dares to be stupid (What else? “Dare to Be Stupid” on Dare to Be Stupid). ACT TWO: Julia is at work, sitting at the bedside of her favorite patient, Mr. Frump, and she expresses her love for the old man (“Mr. Frump in the Iron Lung” on Weird Al Yankovic). Wally and Gary visit her, mostly to make sure she’s okay. Dan may be clueless about her true feelings, but they’ve known all along. It turns out that after the party, Wally did some digging on Krog. It turns out that Krog was never a Hollywood producer. Instead, he was partners with a land developer, a man who has wanted to tear down the Jungle Cruise Line for years to put up another strip mall. Mr. Howler had never wanted to sell. Wally suspects that Krog is going to wreck the Line in the bogus shooting of the movie, leaving such a mess that Mr. Howler will have no choice but to sell. This steels Julia’s resolve. They have to save Dan. Dan doesn’t want to listen to Wally. Julia forges ahead, laying out the evidence. Dan doesn’t want to listen to her either, saying that Melanie would never do anything to hurt him, that they’re in love. Julia retorts that he wouldn’t recognize someone who loves him if she were right in front of him. Wally and Julia leave. Dan is angry, but the seeds of doubt have been planted. What can Dan do? Mr. Howler will be heartbroken when he discovers that his beloved Jungle Cruise Line has been wrecked and will probably take it out on Dan. Worse, Dan has wrecked his friendships with everyone. He’s alone and unsure of what to do. But his friends haven’t abandoned him. Not at all. They rally around him, even Julia. But when Dan remains just as clueless around her, Julia can’t take it any longer. She releases her pent up feelings (“You Make Me” on Even Worse) and kisses him. With his friends at his side, Dan rallies. He steels himself by thinking of what his favorite celebrity would do (“Who, Chuck Norris?” “No, Charles Nelson Reilly!” (“CNR” on Internet Leaks)) and comes up with a plan to get Krog out of the park . . . In the end, Krog is defeated, and when Melanie tries to come crawling back to Dan to save her rear end, Dan responds by either telling her that he hasn’t missed her since she’s been gone (“Since You’ve Been Gone” on Bad Hair Day) OR he tells her he doesn’t want to spend one more minute with her (“One More Minute” from Dare to Be Stupid) [NOTE: It’s a toss-up on these two]. But what to do about the park? Well, as it turns out, Mr. Frump, Julia’s favorite resident, recently passed away and his will stipulated that his massive fortune be left to whatever nurse showed him the most affection. Julia gives some of it to Dan so the park can be fixed. When Mr. Howler returns from his vacation, he’s none the wiser about what happened. Dan tenders his resignation. Mr. Howler is surprised and wonders if it’s because Dan will finally pursue his dreams. Dan says that he will, but not his old dream. He’s found a new one. It entails using the rest of the Frump inheritance to help Wally open a Waffle House (“Waffle King” on Alapalooza) and, in the end, Dan realizes that sometimes the “stupid” dreams are the best, especially if it means being true to yourself, prompting the cast to reprise Dare to Be Stupid. Yeah, I know. It’s not perfect. It’d need a lot of work. But what do you think? How would Dan and friends evict the sinister Krog and his sidekick? 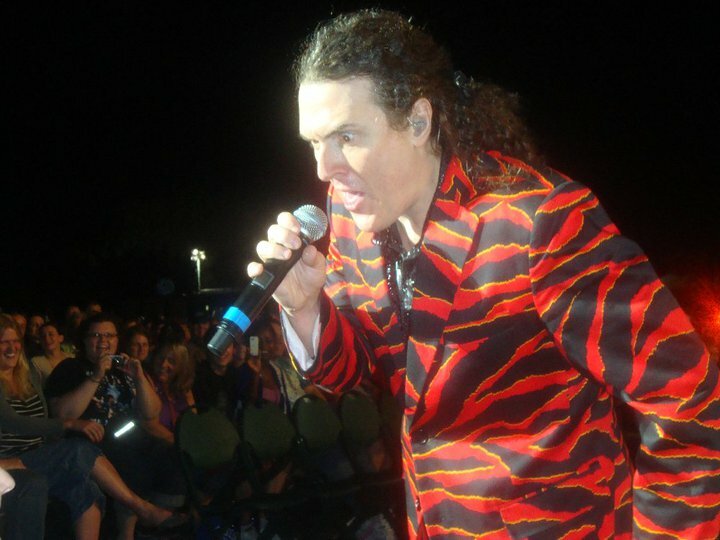 Have I missed any part of Weird Al’s catalog of original songs that should be included? So there we go. I put together this four years ago, but I still think it could be a fun show.